Germain Berthé (GK), Drissa Diakité, Idrissa Coulibaly, Fousseni Diawara, Bakary Sako, Mohamed Konate (DF), Tongo Doumbia, Mamoutou N’Diaye, Seydou Keita (MF), Abdoulay Diaby, Dicko (FW). Aboubacar Camara (GK), Abdoulaye Cissé, Issiaga Sylla, Kamil Zayatte, Lanfia Camara, Djibril Tamsir Paye (DF), Ibrahima Conté, Abdoul Camara, Boubacar Fofana (MF), Ibrahima Traoré, Yattara (FW). National Football team of Guinea were play 44 matches against Mali. In those 44 matches Guinea won 19 matches and Mali won 11 matches and other 14 matches was drawn. In this 19 win of Guinea, the biggest win of 5-0 was come at the very first match between them at 1996. Biggest aggregate between Guinea VS Mali is 7 goals on 10 March 1972, where Guinea won by 4-3 goals in an African Tournaments. At the AFCON, this is their 9th clash. At the past 8th meeting Mali won 3 matches and Guinea won just 1 match and the other 4 matches were draw. 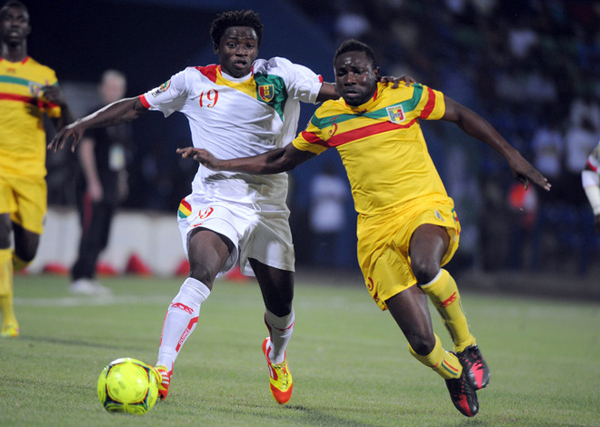 The last meeting at the last year 2014, Guinea defeated Mali by 2-1 goals at Mali. Mali lost their last 3 matches with Guinea from 2013. In their one was the AFCON match. Guinea is playing their 11th stands in this AFCON 2015. They were failed to appearance at the last AFCON 2013. Guinea is the runners-up at 1972 and this is their best result at the AFCON. In their 10th appearances Guinea played 3 quarter finals and one final match. And all other 6 tournaments Guinea left from the Group. Guinea played 35 matches at their 9 appearances and scored 52 goals as well as conceded 51 goals also. They have won 11 matches and defeated 12 matches with 12 drawn. Mali is in their 9th appearances and they had played 6 semi-finals in their 9 8 appearances. At the first AFCON tournaments for them they won the runners-up title. Mali becomes the third place holder at 2012 and 2013 AFCON consistently. The recent form of Mali is not so good; they have won 2 matches out of their last 5 and lost 3. But Mali defeats Algeria by 2-0 goals at last November in their last international matches.